Serbia is friendly, beautiful, culturally rich and good value for money. In the same time it's modern and yet unusual and traditional enough to be interesting. Serbia is friendly and ti's as safe as North America and Europe. Street crime is rare. In general, travel costs in Serbia are highest in Belgrade and at Serbian mountain resorts (Kopaonik, Zlatibor); lowest in the small towns of south and eastern Serbia. Except on mountains, travel costs don't depend on season. Should I reserve hotels in advance? Flat or apartment allows you to make a "home away from home." A rental apartment or flat in Serbia may be the best place for you to stay. Apartments and rooms in Serbia, you can find on our page Serbia Accommodation. 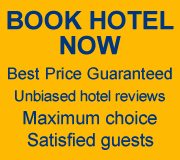 For online hotel reservation, we suggest Booking.com, one of the world's leading online hotel reservations agencies, which attract over 30 million unique visitors each month. 5. Private Tours & Guides in Serbia? Do I need a guide? Touring Serbia and Balkan with your own private guide is the best way to fully appreciate the richness of Serbian's and Balkan's history, culture and cuisine. Without guide, you'll spend too much time on the road and you will not enough enjoy in wonderful destinations. More about travel guides in Serbia. We can help you plan a custom itinerary tailored exactly to your budget, time, preferences. More about your itineraries. 7.What about transport? Train, bus or car? For transport from other countries to Serbia, see Getting to Serbia. Thousands of modern, luxurious buses roar between Serbian cities and towns daily. This is how most Serbians travel. Unfortunately, it's difficult to get fares and schedules, but you can do that easily when you arrive in Serbia. Departures are frequent, and you don't need advance reservations on most routes. Here are sample routes, fares and travel times from Belgrade to many cities. The unit of Serbian money is the Dinar. Exchange rate varies about 100 dinars for 1 E.
Travelers checks are not very useful in Serbia, and that you should use them only if you have some special circumstance that requires them. Use your credit card or cash instead. The best currencies to carry for changing to Serbian dinars are, euros (the best) and US dollars. 9. When's the best time to go? Here's the short list of Serbian public holidays when banks and offices are closed. You can find useful travel maps here.